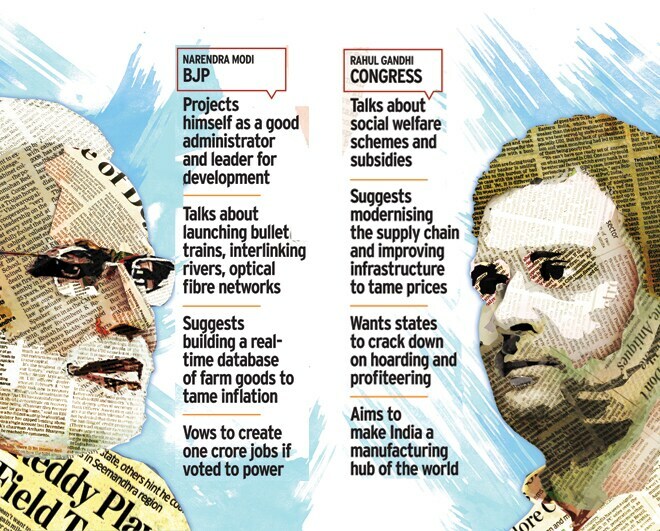 Both Narendra Modi and Rahul Gandhi have presented their broad economic vision, but neither has offered any pragmatic solutions to the most pressing problems facing the Indian economy. On a cloudy January afternoon, barely two weeks into the New Year, Finance Minister Palaniappan Chidambaram met with two industry delegations at Jawahar Bhawan in Lutyens Delhi. He listened intently as officials of the Confederation of Indian Industry and the Federation of Indian Chambers of Commerce and Industry stressed on the need for the Congress-led United Progressive Alliance (UPA) to spell out its economic vision in its manifesto for the general elections due by May. The manifesto, the officials said, should focus on creating jobs and making it easier for businesses to operate, rather than just on welfare programmes, to boost economic growth. Days later, the opposition Bharatiya Janata Party (BJP) called for a similar meeting at its headquarters, where senior leader Murli Manohar Joshi met with industry associations to understand issues that are hurting the economy. The Congress and BJP are not just interacting with industry bodies in the run-up to polls. They are also talking to economists, labour unions and civil society groups, besides tapping into social media, to get inputs for the manifestos that will form the basis of their economic policy if voted to power. The aim of these discussions is to develop a broad-based agenda that appeals not to some narrow vote bank but to a wider audience. "Different parts of the country require different efforts. You cannot have a one-size-fits-all approach," says Ajit Ranade, Chief Economist at Aditya Birla group. 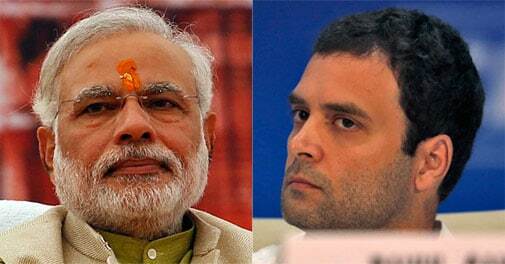 While the two biggest national parties havent yet announced their manifestos, BJP's prime ministerial candidate Narendra Modi and Congress Vice President Rahul Gandhi have indicated their positions on economic issues. Both are seeking to cash in on a sense of disenchantment among people. But, the electoral debate has so far focused more on empty rhetoric. And both Modi and Gandhi have failed to come out with definite strategies to deal with the most crucial issues facing the economy - slowing growth, rising prices, fewer jobs and falling investments. Gandhi, widely believed to be the Congresss choice for the PM's post, has indicated a continuation of the rights-based welfare model followed by the UPA government so far. In January, he favoured increasing the cap of subsidised cooking-gas cylinders for households. Days later, the government raised the annual cap on subsidised cylinders to 12 from nine per household. The anti-reform move sent a negative signal to industry and investors. Congress spokesperson Sanjay Jha defends the partys social welfare agenda. "Economic growth does not mean free-market capitalism without responsibility," he says. "We need a better social security net." Not everyone is convinced, though. Critics say the UPAs massive expenditure on social welfare schemes has bloated the fiscal and current-account deficits. That has prompted warnings of a downgrade from ratings firms, weakened the rupee and dragged economic growth down. "The philosophy of the Congress has been to distribute the cake, not to increase the size of the cake," says an economist who does not wish to be named. "They have done little to promote growth." Also in January, Modi laid out a grand vision for India at a BJP meeting. The Gujarat chief minister spoke about launching bullet trains, interlinking rivers and laying optical fibre networks. The plan evoked mixed reactions. His critics called it unimaginative and lofty while his supporters termed it visionary. Modis development model in Gujarat has also polarised opinions. Columbia University professor Arvind Panagariya has lauded the Gujarat model for accelerated and all-round progress. On the other hand, Nobel laureate Amartya Sen has criticised the Gujarat model, saying it has done little to improve education, health care and human rights. India has been fighting a losing battle to control inflation for more than three years. The battle has been led mainly by the Reserve Bank of India, which has raised interest rates several times. But this has had little effect because inflation in the country is a result mostly of supply-side constraints and not of high demand. Price rise was an important reason behind the Congresss rout in four assembly elections last year. Inflation averaged 6.7 per cent during the UPAs rule until 2012/2013, compared with 4.8 per cent when a BJP-led alliance was in power from 1998/99 to 2003/2004. "Growth cannot be sustainable unless inflation is tackled," says Sonal Verma, India economist at brokerage Nomura. In December 2013, Gandhi said at a FICCI meeting the government must crack down on hoarding and profiteering, a stand that Congress-ruled states later agreed with, to tame inflation. He also stressed on the need to modernise the supply chain and ease infrastructure bottlenecks. But he offered few specific steps to do so. Modi has offered a technology-based solution to control inflation. He said that digital technology should be used to make a real-time database of agriculture goods and prices. This database will indicate demand and supply of various goods, and will help control prices. Such a system, however, can work only if the retail industry is fully organised. That is unlikely to happen anytime soon. Moreover, the BJP has opposed the entry of foreign players in multi-brand retail, an important reform measure that the UPA has been trying to push through. Another issue that should be high on the governments agenda is employment generation. But the electoral debate has not focused much on the topic. This is surprising given that an estimated 12.8 million people join the workforce every year. 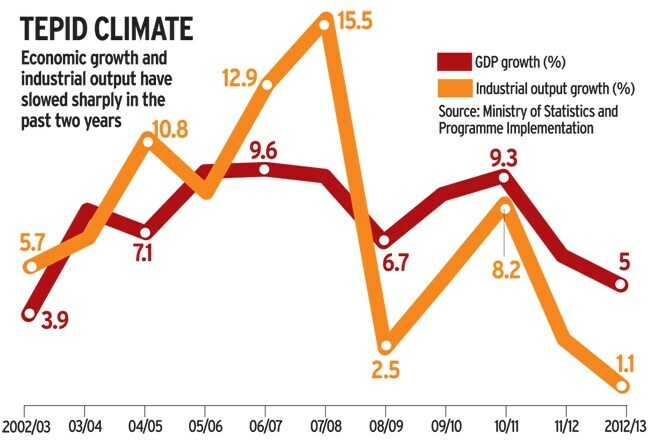 The annual pace of job creation has slowed down drastically to 0.28 per cent between 2004/05 and 2009 from 2.9 per cent during 1999-2005, a Ministry of Labour report shows. The 2012 report also set an employment growth target of two per cent assuming the economy would expand at nine per cent. But that target seems tough to achieve given that the economy is crawling at five per cent. Economists say India is a services-led economy and the country will have to boost its manufacturing sector to tackle its unemployment problem. Gandhi has spoken about making India a manufacturing hub. "I want to make this place at least as much a manufacturing power as China," he said in a TV interview. Critics, however, raise doubts on the implementation of such an agenda, especially at a time when infrastructure constraints, procedural bottlenecks and slowing growth have prompted companies across a range of industries to defer investments. Modi has promised to create one crore jobs if voted to power. That may seem a little ambitious since the employment record of his own state is nothing to write home about. From 2000 to 2010, annual job growth in Gujarat was three per cent. According to the socio-economic survey of Gujarat, 8.79 lakh jobseekers are listed on employment exchanges in the state. Critics say the number would be closer to 16 lakh. On January 30, Finance Minister Chidambaram questioned the BJPs resistance to implementing a uniform Goods and Services Tax. The GST would subsume within it several state and central taxes and has been in the works for nearly a decade. It is expected to increase compliance, tax revenues and streamline processes. But BJP-ruled states Madhya Pradesh and Gujarat have opposed the new system on fears of revenue losses and a perceived shift of fiscal power from states to the Centre. Taxation was one of the key issues brought up by industry bodies in their recent meetings with the Congress and BJP. Siddharth Birla, who led the FICCI delegation at the interaction with the Congress in January, said it emphasised the introduction of the GST at the earliest to boost manufacturing and exports at the meeting. Gandhis close aide and Rural Development Minister Jairam Ramesh has accused Modi of derailing the proposed regime. The BJP has rubbished such allegations. The party recently also proposed a radical idea of abolishing all direct and indirect taxes for individuals and companies and instead imposing a nominal banking transaction tax. The idea invited sharp criticism and seems to have been dropped. While GST negotiations continue, the more pressing matter is a slowdown in investments. In January 2013, the government set up a Cabinet Committee on Investments amid growing frustration in industry over projects stalled due to lack of government clearances, particularly from the environment ministry. Over the past year, the committee has cleared about 300 projects entailing total investment of Rs 6,60,000 crore. But, little has moved on the ground and companies are still sitting on the fence. Gandhi, at the FICCI meeting in December, said the regulatory system must be "rapidly and radically" modernised. "There are no excuses for the length of time required to clear some of these projects... Accountability has to be clear, fixed and time-bound," he said. The same day, Jayanthi Natarajan resigned as environment minister. While Gandhi has courted industrialists in recent months, he has also occasionally championed the cause of the poor. In 2010, he visited the Niyamgiri region in Orissa where local tribes have opposed Vedanta Resourcess bauxite mining project. During the same period, however, he did not engage with protests against Poscos steel plant in Orissa. Modi has actively promoted industries. When Tata Motors scrapped its plan to produce its Nano minicar at Singur in West Bengal due to farmers protest, Modi offered land and other incentives to the company. In fact, many companies have praised Gujarat for facilitating investments. But, even in Gujarat, land acquisition remains a thorny issue. More than 30 villages recently came together to oppose land acquisition for industries. Modis critics say removing procedural hurdles for industries is not enough and he must spell out a holistic policy that ensures development for all sections of the society. So, who has a better grasp on economic matters - Modi or Gandhi? And who is better suited to lead India at a time the economy is growing at its slowest pace in a decade? Gandhi has mostly talked about subsidies and social welfare while Modi has projected himself as the leader for development. But, so far the debate has been full of inanities. "The world is viewing India with skepticism. Growth is down and inflation is up - they are wondering whether these are structural features or are they temporary," says Lord Meghnad Desai, economist and member of the UKs House of Lords. "Indian politicians dont want to talk about costs. They only want to talk about benefits. None of the leaders have spoken about how they will tackle inflation. Will they show fiscal responsibility?" Thats a question neither Gandhi nor Modi have answered yet.